Oh sure, you probably don't need anyone to tell you to start Travis Kelce. Kelce is the number one tight end in football, even if it took missed games from Rob Gronkowski and Zach Ertz to get there. He's got 51 catches for 629 yards and five touchdowns, and you have him locked into your starting lineup every week. But I'm here to tell you he honestly might equal those stats this week alone. Hide your kids, hide your wife, hide your husband cuz the best tight end in fantasy football is playing the world's worst tight end defense. The Giants have now allowed a tight end touchdown in an NFL record ten straight games. If you could play a mythical player named Whatever Tight End Plays The Giants, he would be on pace for a 90/1125/18 season, aka peak Rob Gronkowski, aka the greatest tight end season in NFL history. So yeah, make sure to get Kelce in every lineup and DFS team you've got this weekend. Kroft is not Tyler Eifert but he's done a decent impersonation in the seven games since Eifert went on injured reserve, with 25 catches for 286 yards and three touchdowns. Denver's once vaunted defense has struggled mightily this season, especially against the pass, and especially against tight ends. The Broncos have allowed 746 yards to opposing tight ends, most of any team in the league. That's over 80 yards a game and should put Kroft in position for a nice bounce back start despite his ranking outside the top 15. 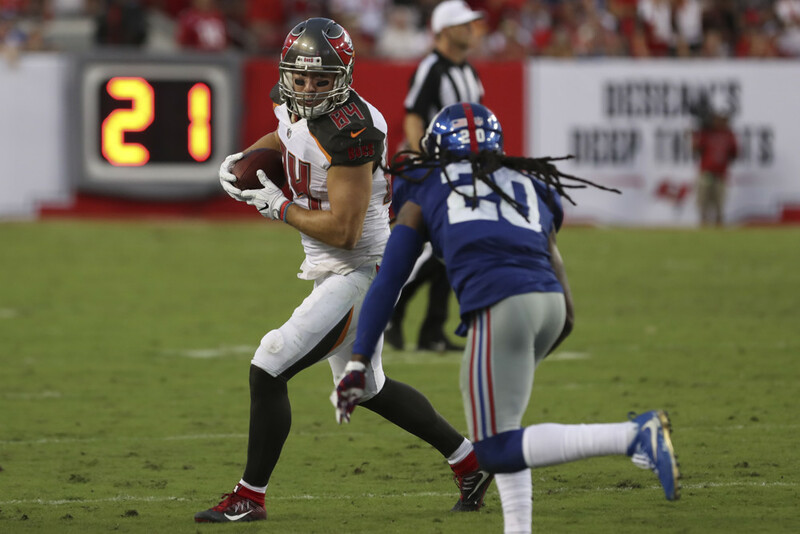 Brate has slowed down the last two weeks with just one catch each game, but he had at least four catches in six straight games before that, including four straight games with a touchdown. A few owners are starting to waive Brate and move on to other options, but his snaps have remained steady and he looks like a strong option this week against a Miami defense among the five worst teams in the league against tight ends. Hopefully Brate can get back on path and find some chemistry with Ryan Fitzpatrick this week. If you're in one of those leagues where everyone rosters two tight ends and there's just nothing left on the waiver wire, perhaps Marcedes Lewis is worth a spot start. Lewis has only 12 catches all season for the Jaguars but seven of them have been in the past three weeks and he's done almost all his damage against bad tight end defenses. Cleveland certainly qualifies, having allowed a league leading 63 receptions to tight ends along with seven touchdowns already. Lewis could find the endzone Sunday. Davis is a play if and only if Jordan Reed is out again. Reed's hamstring has been acting up all season, and Davis has been a more than adequate replacement with over 70 yards in each of the past two games that Reed has missed. New Orleans has actually played pretty good defense in 2017, but only five teams have allowed more touchdowns to opposing tight ends. Whoever Washington starts at tight end will continue to be a strong fantasy play, no matter the opponent.